Урок-презентация по английскому языку для 8 класса "Защита окружающей среды"
Главная / Иностранные языки / Урок-презентация по английскому языку для 8 класса "Защита окружающей среды"
What can we do to save the Earth? Презентация урока для 8го класса по учебнику М.З. Биболетовой и др. «Enjoy English» Выполнила: Рыбина Н.М. учитель английского языка МБОУ СОШ №45 Приокского района г.Н.Новгорода 2014 г.
Phonetic drill [ I ] ecology, eclipse, effect, enough, eruption. [ p ] protect, pollution, pack, prohibit, prevention. [ d ] dangerous, endangered, damage, desert, destroy. 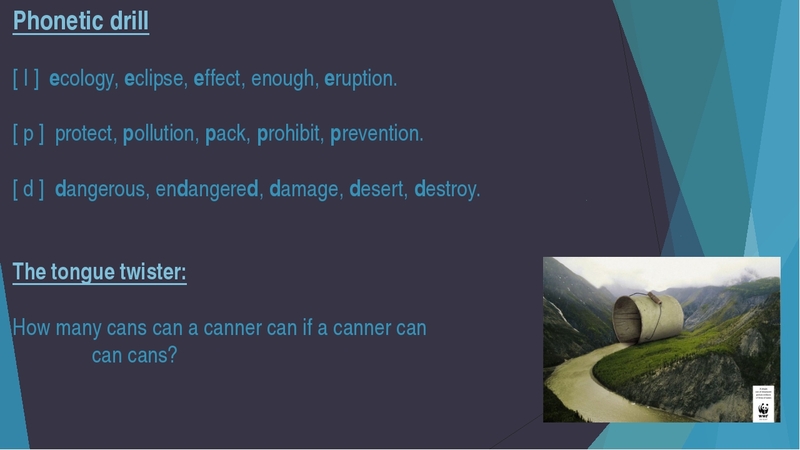 The tongue twister: How many cans can a canner can if a canner can can cans? Use these word expressions in the sentences of your own. 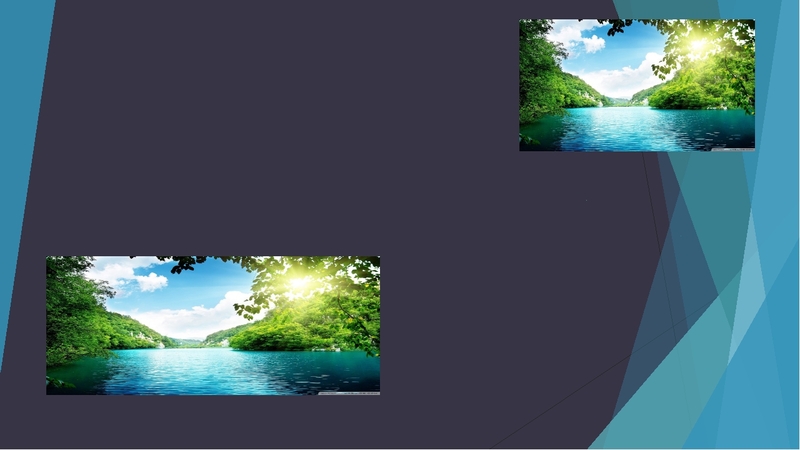 For example: People must protect environment. Air pollution is one of the ecological problems nowadays. Emergency workers have to wear protective clothing. 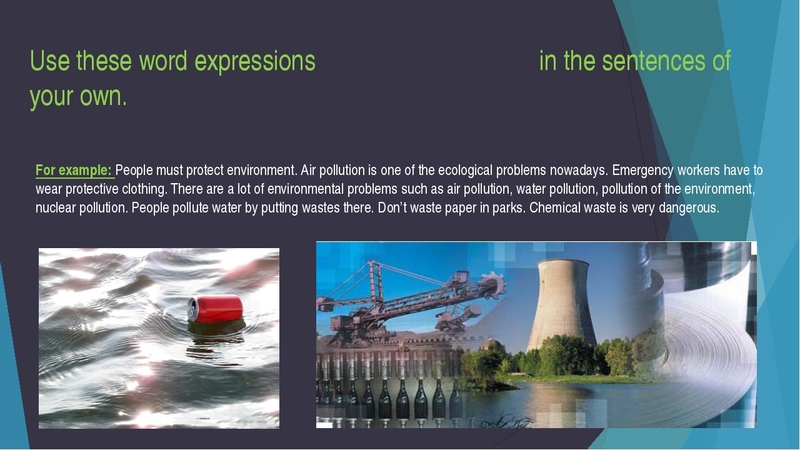 There are a lot of environmental problems such as air pollution, water pollution, pollution of the environment, nuclear pollution. People pollute water by putting wastes there. Don’t waste paper in parks. Chemical waste is very dangerous. Read the text and find out if you were right. Give a title to the text. 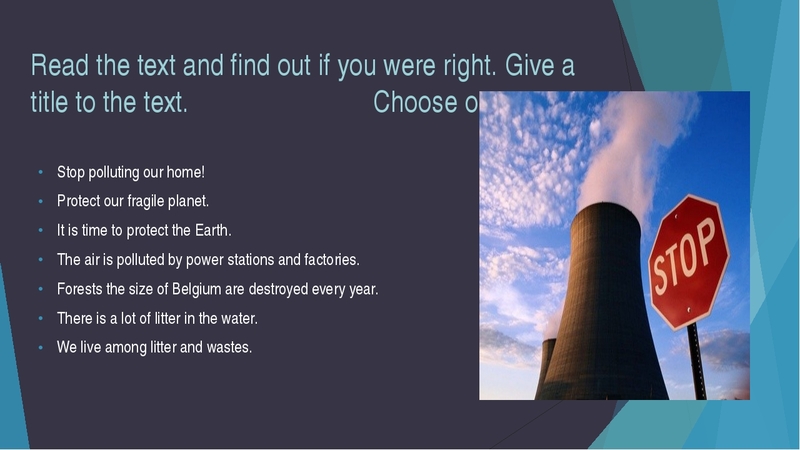 Choose one: Stop polluting our home! Protect our fragile planet. It is time to protect the Earth. The air is polluted by power stations and factories. Forests the size of Belgium are destroyed every year. There is a lot of litter in the water. We live among litter and wastes. Read the text and underline the words that you don’t understand. Try to guess their meanings in the following way: 1. 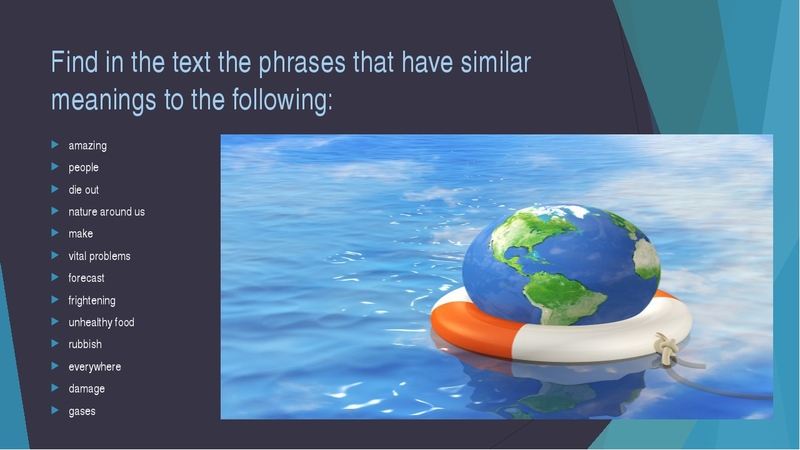 Reread the context in which the word is used (the sentence in which it is plus the sentence before and after it). 2. Write down three meanings that you think are possible. 3. 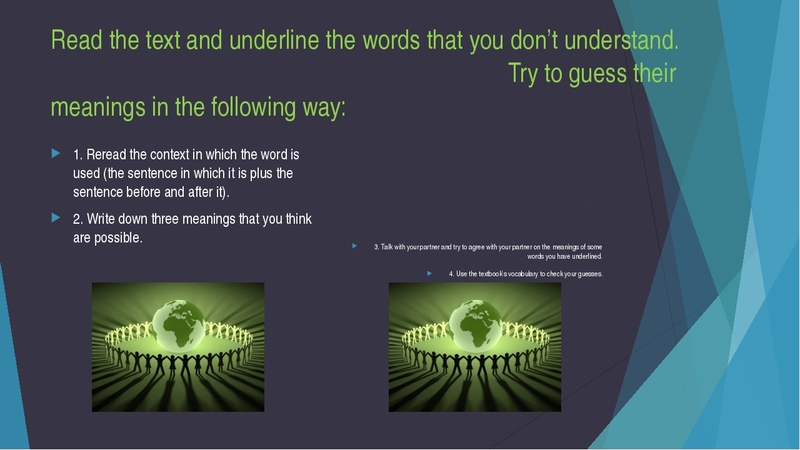 Talk with your partner and try to agree with your partner on the meanings of some words you have underlined. 4. Use the textbook’s vocabulary to check your guesses. 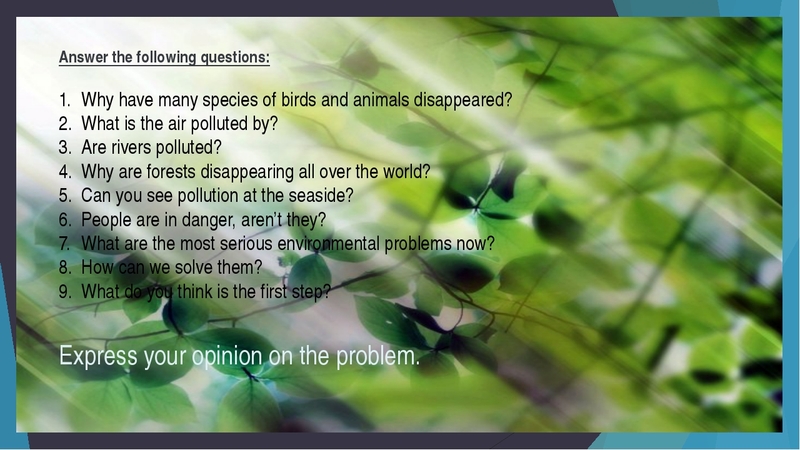 Answer the following questions: Why have many species of birds and animals disappeared? 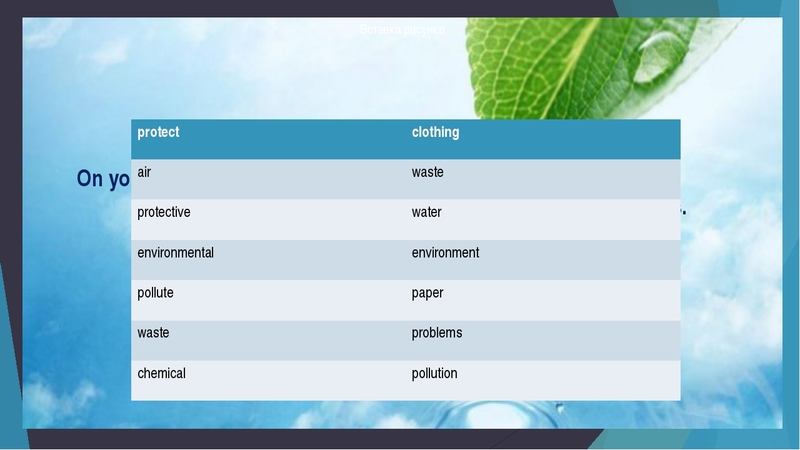 What is the air polluted by? Are rivers polluted? Why are forests disappearing all over the world? Can you see pollution at the seaside? People are in danger, aren’t they? What are the most serious environmental problems now? How can we solve them? What do you think is the first step? Express your opinion on the problem. 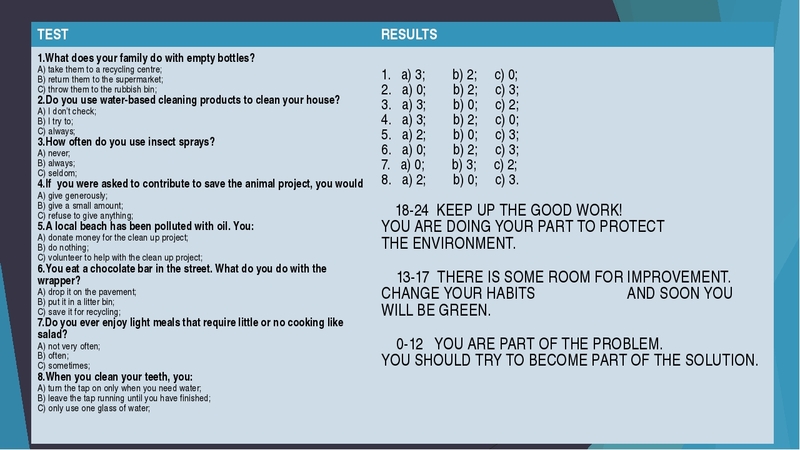 TEST RESULTS 1.What does your family do with empty bottles? A) take them to a recyclingcentre; B) return them to the supermarket; C) throw them to the rubbish bin; 2.Do you use water-based cleaning products to clean your house? A) I don’t check; B) I try to; C) always; 3.How often do you use insect sprays? A) never; B) always; C) seldom; 4.If you were asked to contribute to save the animal project,you would A) give generously; B) give a small amount; C) refuse to give anything; 5.A local beach has been polluted with oil. You: A) donate money for the clean up project; B) do nothing; C) volunteer to help with the clean up project; 6.You eat a chocolate bar in the street. What do you do with the wrapper? A) drop it on the pavement; B) put it in a litter bin; C) save it for recycling; 7.Do you ever enjoy light meals that require little or no cooking like salad? A) not very often; B) often; C) sometimes; 8.When you clean your teeth, you: A) turn the tap on only when you need water; B) leave the tap running until you have finished; C) only use one glass of water; 1.a) 3; b) 2; c) 0; 2.a) 0; b) 2; c) 3; 3.a) 3; b) 0; c) 2; 4.a) 3; b) 2; c) 0; 5.a) 2; b) 0; c) 3; 6.a) 0; b) 2; c) 3; 7.a) 0; b) 3; c) 2; 8.a) 2; b) 0; c) 3. 18-24 KEEP UP THE GOOD WORK! YOU ARE DOING YOUR PART TO PROTECT THE ENVIRONMENT. 13-17 THEREIS SOME ROOM FOR IMPROVEMENT. CHANGE YOUR HABITS AND SOON YOU WILL BE GREEN. 0-12 YOU ARE PART OF THE PROBLEM. YOU SHOULD TRY TO BECOME PART OF THE SOLUTION. What new words have you learnt from the text? 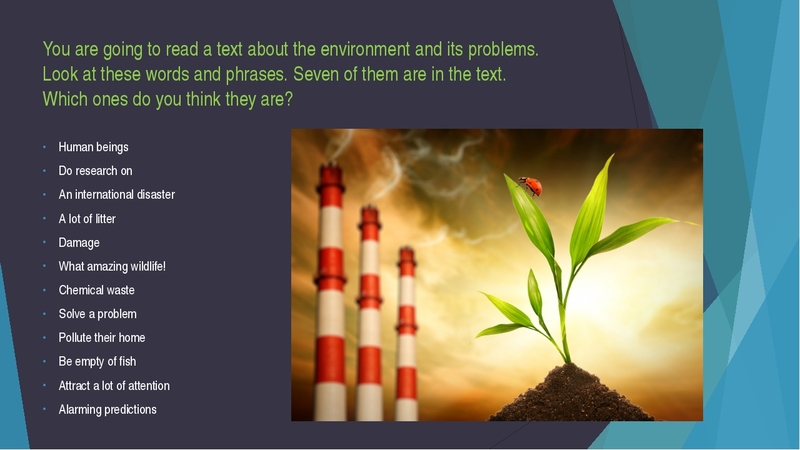 Which of the environmental problems do you think are the most dangerous? Which of the problems have we got at our place? Thank you for your work! 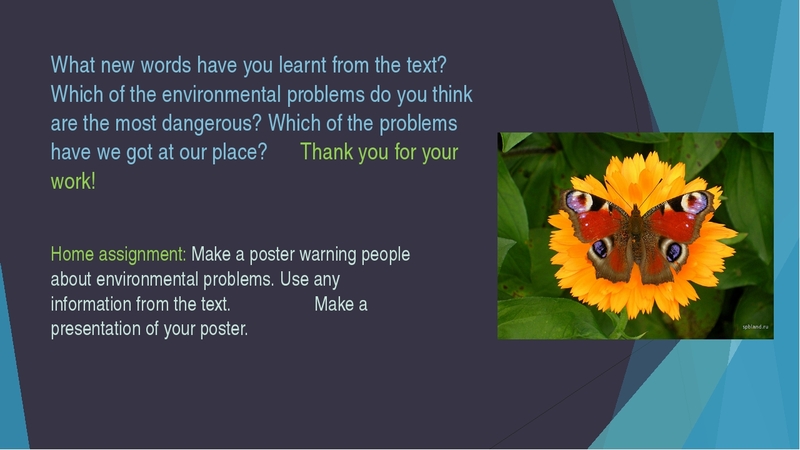 Home assignment: Make a poster warning people about environmental problems. Use any information from the text. 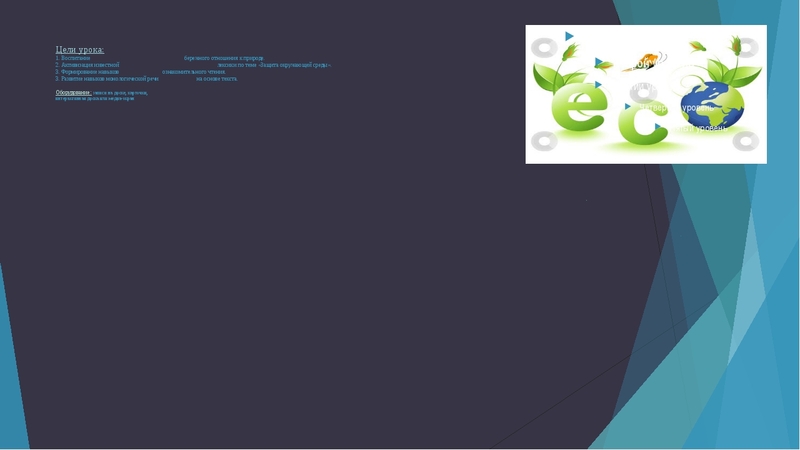 Make a presentation of your poster. Miriam Mackley. 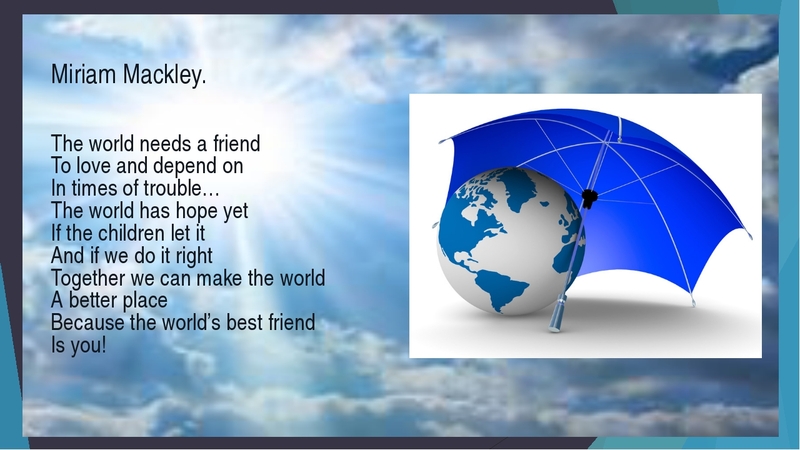 The world needs a friend To love and depend on In times of trouble… The world has hope yet If the children let it And if we do it right Together we can make the world A better place Because the world’s best friend Is you! Описание материала: Предлагаю Вам презентацию урока по теме: “Защита окружающей среды". Этот материал предназначен для обучающихся 8 класса. Урок направлен на воспитание уважительного отношения к окружающему миру, природе. Дает возможность детям рассуждать на тему пагубного воздействия человека на окружающую среду и делать соответствующие выводы. Визуальное представление, как то: видео и презентация помогают быстрее усвоить материал. Цель урока: воспитание бережного отношения к природе, активизация известной лексики по теме "Защита окружающей среды", формирование навыков ознакомительного чтения, развитие навыков монологической речи на основе текста.